Not much is known is about the Huns or their greatest leader, Attila: we don’t know their language, we don’t know their origins, nor their belief system. But John Man valiantly attempts to reconstruct their motives as well as their path of destruction, from the few diaries and artifacts that have been found. Some historians say the Huns are descendants of the Xiongnu, a nomadic peoples from Central asia. This would make sense since the few artifacts (bow parts, pots, swords) are very similar between these two groups. Both nomadic cultures migrated between pastures for their animals and specialized in mounted archery using assymetrical bows that could launch arrows with enough force to pierce iron armor. Regarding what the Huns looked like, they were most likely a mix of Turkic and Central Asian: John Man relies heavily on a Roman civil servant, Priscus,’ account of the Huns. Priscus met Attila during a failed plan for Erika, Attila’s trusted Goth general, to assassinate Attila. Priscus describes Attila as follows: “short of stature, with a broad chest and a large head; his eyes were small, his beard thin and sprinkled with gray; and he had a flat nose and a swarthy complexion.” The Huns were not Germanic, although they assimilated many Germanic tribes (Gepids, Ostrogoths, Alans) during the course of their pillaging. John Man recounts a remarkable tale of Attila’s rise to power. Attila’s father was King Mundzuk who died early in Attila’s life, which left Attila and his brother Bleda to vie for control of the Hun hordes: Bleda conveniently died, which left Attila with full control to terrorize the Romans, which he did by pillaging cities and leaving few survivors in 70 cities including Naissus, which was 20 miles from Constantinople. His ruthlessness inspired fear across Europe which accounted for Eastern Rome’s willingness to pay monthly bribes to Attila. In 450 A.D., Emperor Valentinian’s sister, Honoria, sent Attila an engagement ring, with the bizarre hope that the two could rule Rome: Attila accepted. Attila amassed a large army which required the Roman general Aetius to ask for the assistance of the barbarian Visigothic King Theodoric I, in stopping Attila’s advance. The two armies fought in the battle of Catalaunian fields which effectively stopped the Hun advance on Rome leaving an estimated 15000 dead. 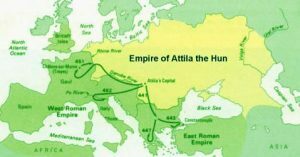 Attila withdrew back east to his base near Hungary. He wedded another wife, Ildico, and allegedly on the wedding night, indulged too heavily in merry making and booze, and was found the next day in a pool of his own blood, which flowing from his nose and mouth. Historians, say he died from a hemorrage. In my non-important opinion, he was assassinated. We know that eastern Emperor Theodosius had previously attempted to have Attila assassinated, perhaps his successor Marcian, was successful. In conclusion, the Huns present an odd and mysterious chapter in history.